I can’t believe I’m writing another Memorial so soon. This time for Lindsey. My heart is torn open. But at the same time, I’m beaming with pride for who she was and how she helped me grow. 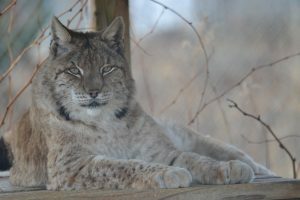 At nearly 20 years old, Lindsey the Eurasian Lynx wasn’t geriatric to us. At least she never showed it. 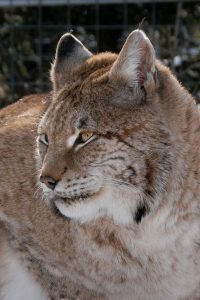 She was a very independent and strong lady, like every female Eurasian lynx I’ve met in my rescue work. So, it shouldn’t surprise me that she hid her cancer so well. But it still hurts none the less. As one of the first 10 founding cats of the sanctuary, Lindsey was very special. She’d seen it all alongside me – from the crazy days of starting the sanctuary near Atlanta, Georgia to our move to Minnesota. She arrived at a young age, back when we took in cats from fur farms. She was unsocialized, but not from fear, rather from determined independence. Lindsey called the shots. Even at just five pounds, that didn’t stop her. I think that’s why I loved her so much. That bold spirit taught me the most important lesson about rescuing wildcats and running a sanctuary. I was young, naïve and my heart was open wide. I thought If I loved each rescue enough, it could fix anything. It could reverse all they’d been through. But you can never love the wild out of a wild animal, and you shouldn’t want to. I used to think if you loved them all enough, they’d love you back – it’s what I hear from private owners now. Love does fix all, just not the way I envisioned. All the love in the world didn’t make Lindsey stop swatting or growling as a kitten. All my love didn’t make her sweet and docile. But she taught me to love her for what she was – a lynx. A lynx caught between two worlds. When I backed off, gave her space to be out in tall grass with trees, she grew up becoming an independent and strong wild cat. She powered through everything – sanctuary moves, habitat moves and did only what she wanted. She didn’t like to be locked out for cleaning, so she made it our job to find creative ways to make it worth her while. She intimidated even our savviest caretakers. And then the most amazing thing happened. Lindsey would purr, rub and present her beautiful backend when I approached her habitat. After finally giving her the respect and independence a wildcat deserved, she respected me back and gave me what I’d longed for – to know she knew I only meant to be a friend, not foe. She always remained strong and lived every day on her own terms. She loved being in the center of her habitat, taking naps under her pine tree. She never complained and had a routine to her day. As the years progressed, her outward affection for me grew and she would always greet me at the fence. After her lessons early on, I no longer expected it, but I very much appreciated it. It was her way of saying thank you for letting her be who she was – a lynx. At 20, she had arthritis and her huffs to the staff were less threatening. But she still demanded and received the respect she had in her prime years. She never showed any outward signs of being uncomfortable or having trouble breathing. The first morning she didn’t come up for her morning medications to demand her treat, we knew we had to intervene. During sedation, her heartrate became erratic and she stopped breathing. She passed just moments before we were going to help her move on. But that rang true to Lindsey’s spirit – it had to be on her own terms. Our vet team found that she had an advanced case of lung cancer – something that surprised us all. She masked the symptoms as wild animals do. Lindsey – Heaven is as big as you make it. You can have as much space and freedom as you want. And your friends are there for the moments you want to say hello. Thank you for teaching me the most important lesson of all – wild is wild. Lindsey, a Eurasian lynx, was one of 30+ kittens born on a fur farm in Saskatchewan, Canada. Sadly, fur farms still prosper in both the United States and Canada. Had Lindsey’s path not led her to The Wildcat Sanctuary, her life would have ended prematurely on the fur farm at the age of two. Unfortunately, there are many others like Lindsey who are not as lucky and suffer unimaginable fates in fur farms each year. 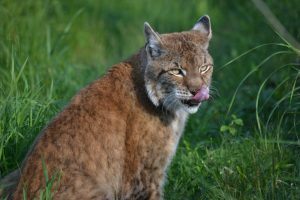 Luckily, both Lindsey and her brother Otis were given a second chance to live out their lives at The Wildcat Sanctuary. Understandably, Lindsey arrived at the Sanctuary filled with mistrust. She was very aggressive and quickly developed a reputation of being a bully among the other residents. But, our keepers have worked very patiently with her to bring her around. She now enjoys living in the Wildcat Pines section of the Sanctuary and her habitat is filled with lots of pine trees, a hammock and perches to play on. Like a lynx in the wild, Lindsey enjoys hanging out in the pine trees where she has a hidden vantage point on everything going on around her. Lindsey, like all the rescues at our Sanctuary, would love to have you as her sponsor. Our sponsorship program is how we provide our cats with the best veterinary care, nutritious diet, enrichment, and a habitat that assures they live wild at heart.